Today marked the Tour for Humanity’s second day at a Montreal high school. Friends of Simon Wiesenthal Center (FSWC) Educator Elena had another great day, thanks in part to the incredible hospitality of the organizer of our visit. He offered excellent feedback from all of the participating teachers as well and felt that FSWC's programs were an excellent way to help students understand the significance of the Holocaust and how genocides and other conflicts continue to shape our world today. He expressed some surprise that the students behaved so well because on Friday we worked with two “learning resource” classes, students who are withdrawn from regular class programs due to behavioural or academic challenges. Elena found those two workshops to be the best of the day with students more willing to ask questions and make comments. Elena made sure to talk with them about the fact that hate crimes are more likely to be committed by young people and showed them our video about hate graffiti and how FSWC can help young Canadians move forward from hateful actions. At the end of the day the organizing teacher was enthusiastically planning a full week in Montreal for the next school year. He works with three different high schools in the Montreal area and has connections to several more in the board. The FSWC classroom was also busy today with a gifted Grade 7/8 class from a local Catholic school. The class participated in a Lessons and Legacies of the Holocaust workshop n the morning, followed by a presentation from Holocaust survivor Andy Reti in the afternoon, and finished with a discussion of hate and intolerance in Canada. 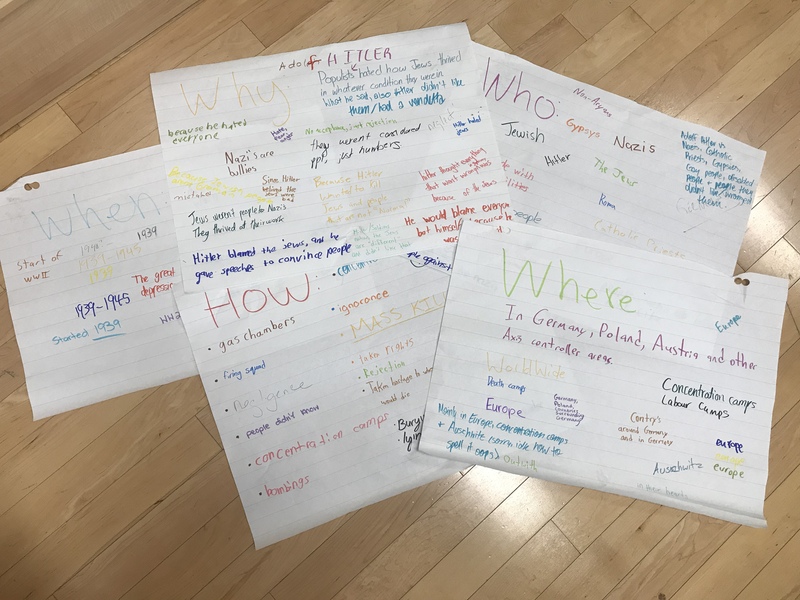 FSWC Educator Emily started off the day with an activity where students wrote some of their past knowledge about the Holocaust around the room, which was a perfect start to the workshop. The activity gave Emily an opportunity to assess their prior knowledge, while also giving the students to opportunity to speak clearly and openly about what they had already learned. Emily moved into a discussion of the history of the Holocaust, and had quite a few questions come up about the camps, how they were built, and what daily life was like for the victims. The striped pants on the wall were a great piece to direct the attention of the students when Emily spoke about the camps, as many of the students had read The Boy In The Striped Pajamas. Emily also had a good discussion about what steps Germany has taken to remember and atone for the Holocaust in the years since the end of the Second World War. The students were wonderful with Andy, very attentive to his talk and willing participants during the more interactive segments of his testimony. They were so excited to go up and shake his hand after the presentation, Emily thought they were going to trip over one another! It was so wonderful to watch this exchange of information and to watch these students become witnesses for future generations.